In full transparency, we reached out to Four Sigmatic to see if they were interested in sponsoring YOM because we truly enjoy + feel soul good whenever we drink their magical mushroom elixirs. And we're thankful not only for our support, but they're giving the soul tribe 15% OFF your Four Sigmatic orders! What the what?!? A magical meditation superfood coffee? Did you know there's a whole kingdom of healing mushrooms that have been time-tested for centuries in the East AND West and now scientifically proven to provide our minds and bodies with a variety of health benefits. Four Sigmatic is combining the powers of these four shrooms with coffee to boost our immunity, energy and longevity. (pssst... they also sneak in other superfoods and adaptogens like rohiola, eleuthero and schisandrato in their elixirs). (aka Allie's hair) Buddhist monks have been drinking Lion's Mane for centuries to deepen their focus and concentration during meditation, while simultaneously improving their cognitive function and memory. This beauty protects our nerve cells at the forebrain which is where most decision making occurs + may slow or completely reverse cell degeneration in the brain, preventing us from diseases like Alzheimer's and Parkinson's. (aka liquid yoga) is our bedtime drink to activate sleep cycles. It’s like a safe tranquilizer for the brain. Chinese + Japanese herbalist often recommend Reishi for insomnia.This is also the mushroom best known to calm our nervous system and may help you alleviate stress and anxiety. (aka our energy shot) these bad boys get us fired up by boosting our energy levels before we run, flow and break a sweat. We've also been using Cordyceps as a healthy coffee alternative (that tastes just as robust) to overcome the midday slump. Studies have also found Cordyceps to act like a natural cancer treatment by preventing the growth of tumors. (aka the superhero shroom) Chaga fights the common cold and flu, as this antioxidant-packed shroom contains compounds that boost our immunity. Ooo, and we must mention that it also contains the antioxidant melanin which is known to protect our DNA and promote beautiful, long, shiny thick hair and glowing skin. 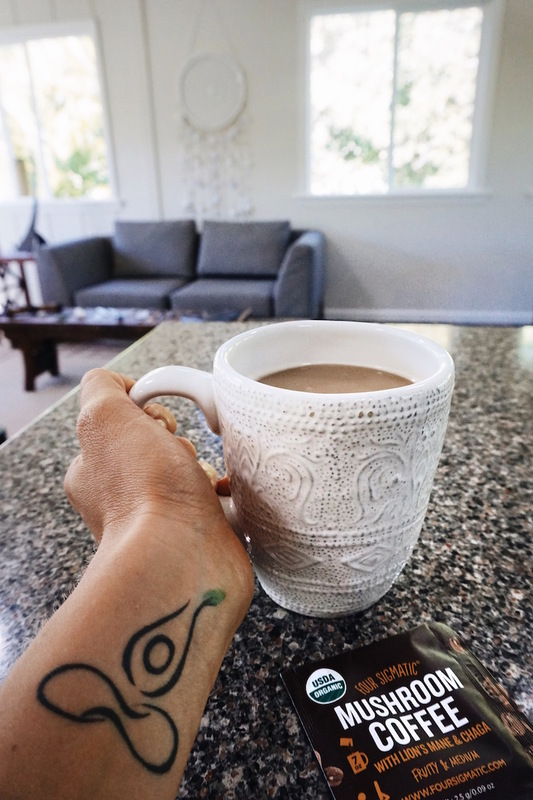 Best part... we love that Four Sigmatic combined a magical mix of these mushroom adaptogens with coffee, so we can drink it guilt-free. And for frequent coffee drinkers like us, if you mix the elixirs in with your coffee, decaf, or just drink the instant mixes alone, then you may enjoy that soul-gratifying sensation of sipping joe without the crazy jitters and stomach pains, (which is easily triggered if we have too much coffee without the shrooms). Kudos to you, but also, we're surprised you read this far. Good news for you though! If you or anyone you know are big matcha lovers (like us) then you MUST try their mushroom matcha mix. Love hot chocolate? Try their Hot Cacao mix. + sometimes we just mix their elixirs with hot water and almond milk for a soothing drink or with reishi before bed. Fuel your body + mind with Four Sigmatic for 15% OFF your orders! + email or DM us your photo or send us a screenshot of your soultribe order with Four Sigmatic so we can save it, maybe feature it somewhere and thank you!